I guess whoever made the graphic thought it was really clever. 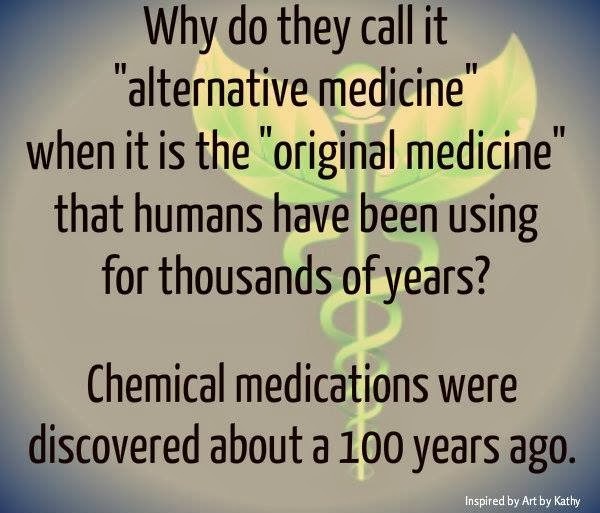 It would have been a lot more clever had they recognized and acknowleged that "chemical medications" have been around for those same thousands of years. You see, the herbs and berries and juices and oils touted by alternative medicine are composed completely and solely of "chemicals". EVERY SINGLE BIT. There's NO ingredient in ANY natural medication that is NOT "chemical". Not one, ever, ever in the history of ever. The closing statement of the graphic above is ludicrously non-informative, and it is just plain wrong. The problem with some of the natural remedies isn't that they're natural. And the "problem" with artificial chemicals isn't that they're artificial. At least, not when you put your mind to it. Let's take for example the case of willow bark tea... a very effective painkiller. But from experience and careful testing we know that of the myriad chemicals in willow tree bark, only one kills pain: Salicin. Now, why does salicin alleviate pain? When metabolized by the body it breaks down into two components, one of which, salicylic alcohol, is further metabolized into salicylic acid, and that's the stuff that kills pain. It does that by inhibiting the enzyme that create prostaglandins, which are fatty molecules that both communicate pain and assist blood clotting. Your body does a lot of chemistry to get you there, but the thing in the bark that's useful is the salicin. Knowing this, chemists took their knowledge of the plants, isolated the active ingredient that does the work, removing all the other ingredients that don't, and stabilized it. The result is acetysalicylic acid, which metabolizes directly to that same salicylic acid... the same stuff that you get to from willow bark, without being adulterated by extraneous ingredients. Your body wouldn't look for the "made by" label on the molecule even if such a thing existed. And because the resulting chemical is pure, the dosage can be controlled. You don't know how much medicine you're getting from a willow bark infusion; but you do from a pill. That pill, by the way, is called Aspirin. It's more like 150 years old, as it was first prepared in 1853. What in it is doing the work? Can it work better? Safer? In a controlled fashion? Socrates was put to death using a tea made of hemlock. Like all plants of the time it was organically grown. I suppose you could say that he died of "natural" causes. Strychnine is all natural. It's so toxic that the poison and the plant have the same name. That is, when we're not calling it "rat poison". Cyanide is found in all-natural wholesome apples, cherries, peaches, plums, almonds, and apricots. I know that essential oils are all the rage now, but unless carefully prepared in such a way that negates any possible claim of being "natural", some of them (extract of bitter almond, for instance), could quickly kill you. Cassavas are nice. They're what's used to make tapioca. But they're also toxic if not processed. If you like your cassavas as God made them, you may enjoy having pancreatitis. Potatoes contain alkaloids like solanine, so you don't want to eat the green ones, and you definitely want to cook them thoroughly; otherwise you could wind up organically dead. Likewise, tomatoes and other members of the nightshade family contain poisonous solanine. The berries of the tomato plant are OK to eat, but make a tea from the leaves only if you're all done with living and would like to leave a sun-dried corpse. Try eating horse chestnuts and see how many you get down without experiencing projectile vomiting and convulsions. If you eat them quickly you could enjoy paralysis. I could go on for a very, very long time. There are as many dangerous, poisonous, and inedible plants, bacteria and fungi as there are beneficial ones. Anyone who claims that something is safe merely because it is "all natural" is either lying to you or uncritically repeating a falsehood that he or she heard. Don't you be the one to do that. The very first thing you should ask when confronted with the phrase "all natural" is "has it been tested, and how?" Even poisons can be medicines in the right doses. And even oxygen can be toxic in the wrong dose. And chemicals... even the natural ones... react with those around them. How effective they are is often determined by the company they keep. What pharmaceuticals do is control those parameters so you know what your'e getting. And even then the results are not 100%, nor will they ever be, as everyone's body chemistry is subtly different. This blog post is NOT a claim that all alternative medicines are bad. Since you're reading and this isn't a conversation, I don't even know what your favorite underdog is. Rather, it's an admonition to use your mind and neither accept something because it contains a "good" buzzword nor reject something because it contains a "bad" buzzword. Scientists don't do that, and neither should you. Remember, "alternative medicine" that is proven to work is called "medicine". You're making the claim, so you have a burden that you can't pass off... the answer to anyone who doubts your favorite alternative treatment is for you to prove it works. Not with anecdotes, and not with folksy sayings, and not with superficially slick yet fundamentally logically flawed platitudes about how long people did it the "traditional" way. Instead you prove it with proof. That would be double-blind repeatable studies that show that the treatment is more effective than a placebo. It's been thousands of years, so there's really no excuse for not having done it by now. On Facebook, Heather observes that "Doctors are more inclined to prescribe pills rather than a plan for good nutrition that could perhaps have the same (or better) results when taking into account side effects." Correct. To be fair, though, many doctors of my acquaintance do stress nutrition, and have for a long time. They also, if you ask, will admit that the vast majority of the things that can go wrong with a human body will fix themselves, given the opportunity. A great example: A few years back I tore both rotator cuffs in my shoulders. The doctor offered both painkillers and surgery, but when I asked for other options he said it would heal if I exercised it properly... but it would be painful. I hung a simple pulley from the ceiling and used it to help work the arms past the point of pain where they'd "catch". And yup it was painful, but they did heal. And to be honest, the pain wasn't THAT bad. I've been hurt worse playing baseball. Unfortunately this ability of the body to fix itself often leads to the erroneous conclusion that some something else did the healing. You take Brand X and get better, and you reach the conclusion that Brand X cures your ailment, when you'd've healed on your own anyway. Most cold medications do exactly that. You take it "for your cold", but really the common cold is going to run its course. You're really taking the medication to reduce the symptoms. Your resulting conviction that the cure worked is called "confirmation bias", and it's a logical fallacy. Even then, reducing the symptoms isn't always the best idea. Your nose stops up and you get a fever because that's how the body fights off invaders. However, back to nutrition. Doctors have to take it into account to some degree, and more should, because even "healthy" fruits and vegetables may not be healthy in company... for instance, there is a HUGE laundry list of medications that can be rendered impotent by eating grapefruit. Sounds weird, but there you go. Grapefruit contains anti-oxidants and vitamin C and they lower cholesterol, which is all great; but often not when you're on medication. Thanks for the interesting commentary, Dave. I do think that the "active" ingredient in a substance exists in a highly sophisticated context of micronutrients and energetics and so on, a synergy that (although it may be very subtle and not currently noticed by our scientific instruments, as that's not what they're looking at) causes the "active" ingredient to work at its best. We are a culture of parts, not of wholes, but nature works in wholes exclusively, and we forget that to our detriment. That's not to say that something like aspirin doesn't work well; just to point out that the most measurable part of the phenomenon is almost certainly not the only force at play. I agree with you about all the rest, though! That's certainly a possibility and sometimes a reality, but it's not the only one, nor by some measures the most likely one. First, let's remember that the substances exist within the plants for the plants' benefit; not for ours, and that our body chemistry is very different from that of a plant. Even within animals, body chemistry matters. For instance, chocolate is a delicious treat for humans, but poisonous to dogs. So even when we consider that the chemical is found with a holistic mix, that mix isn't necessarily for you, especially if the plant is from a remote region where humans had little or nothing to do with its breeding. Remember, organisms develop those traits that are most beneficial to their own survival within an environment. That environment includes other organisms, so symbiosis does exist, but if it's an obscure species, you're not part of that. You're taking and using someone else's stuff to your benefit, and that's not always appropriate to your needs. The substance works best with the entire chemistry of the plant, as per assumption. The other chemical components of the plant make no difference. They're neutral. But, being neutral, they still dilute the medicinal substance and make the dosage less predictable. The other chemical substances are directly harmful, or even poisonous. Three out of the four possibilities are not the rosy one pictured. Which of them is true is answered by the scientific queries I previously listed. "What's working?" "Why does it work?" "How does it work?" "Can it work better? Safer? In a controlled fashion?" There's a 75% chance of getting it wrong by merely trusting that nature does it best. Remember, my point isn't that "natural" is necessarily bad. It's that it's not necessarily good either. It is what it is, and we can't determine what that is by anecdote and assumption. So trust, but verify. Per the Anonymous comment here, Tim Minchin hits the same note (and a few more) in a 9-minute beat poem called "Storm". Tim's a bit more confrontational about it. I would like to point out, too that Aspirin is hardly what I'd call "virtually side effect free" as he claims. Actually, there's a fairly long list, including allergies, angiodema, bleeding, and Reye's syndrome. Here's the list [link]. Nevertheless it's still my go-to medicine for pain. Still, while science certainly doesn't have ALL the answers, concerning the physical world, it is how we discover them. 'On the contrary, Storm, actually, before we came to tea I took a natural remedy derived from the bark of a willow tree. A pain-killer, virtually side-effect free. It's got a weird name. Darling, what was it again? Maspirin? Baspirin? Oh, yeah, aspirin! Which I paid about a buck for down at the local drug store!'"